My boyfriend’s first response after taking a bite of a rhubarb crumb bar, “delicious”. When the bars first came out the oven I was a bit unsure. 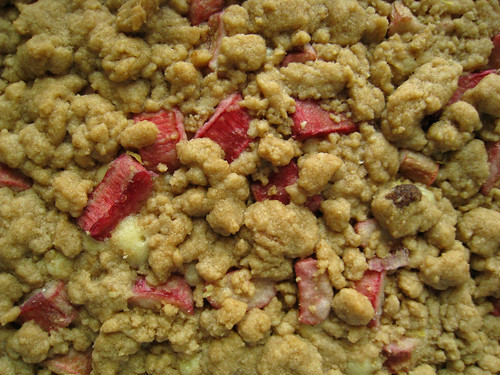 The rhubarb looked dry I was afraid it was going to taste chewy. 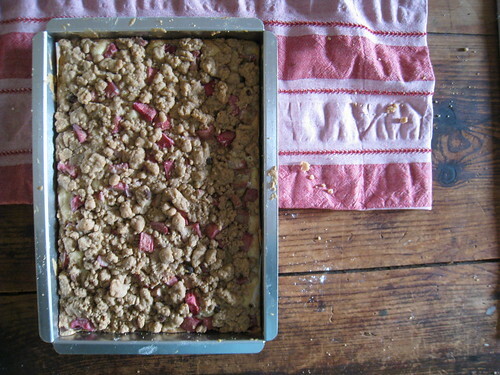 Turns out the rhubarb is super moist and just the right amount of sweet. I doubled the recipe to fit into my larger 9 x 13 pan. I also added lemon zest to the rhubard mixture and some nutmeg to the crumb topping. I will be making two more cookie recipes today so stay tuned. I have to run…Greg is eating all the bars! I was a bit tipsy. And you were always a good cook, but you did refuse to bake. Or was that just a ploy to make me bake? Are you drunk Gagnon? I've always been a great cook. You didn't even spell my name right! Maybe I only shared the crumby cookies with you? I just put some in the oven- it looks very good, so far! I remember back when you couldn't even make a snickerdoodle! Well done, Katie! Hey Katy, I saw this in Everyday Food, but now I definitely want to try it after seeing your post. We love rhubarb too! Kate – this is seriously one of the best treats you've ever made. The mess in the kitchen was worth it. The rhubarb adds more bitter than sweet. The crumb makes the sweet but not to sweet. The moist spongy cake holds it all together nicely. Writing this comment makes my mouth water. Thanks!